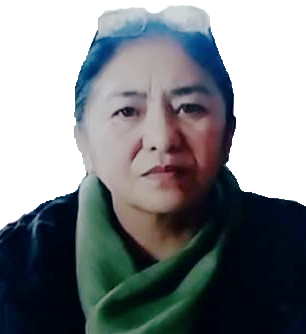 17-04-2019 Repatriation of Smt. Rehana Kousar And Savika Rani ( Staff Nurses) to their parent departments. Order No. 239NG of 2019. 11-04-2019 NOTIFICATION of Technical Staff required for Conduction of DPC Order No. 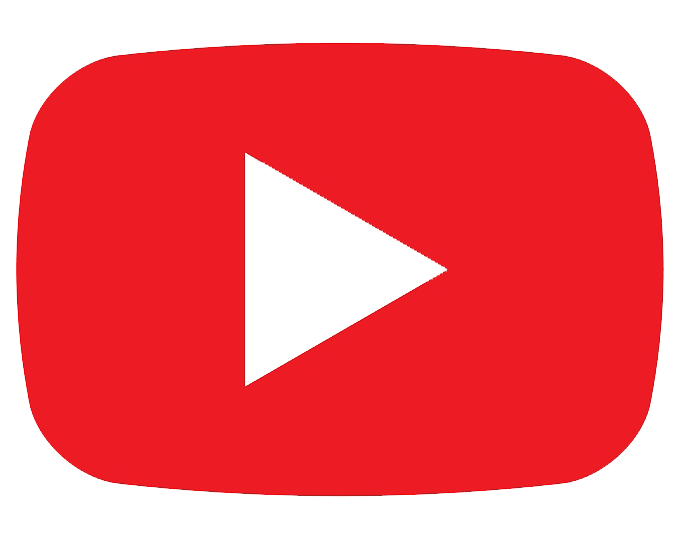 DHSK-Est-4-NG-149-S.List-Tech-Staff-2019-2921-23. 11-04-2019 Information about Technical Staff required for Conduction of DPC. Order No. DHSK-Est-4-NG-149-ll-Tech. Staff-2019-2925-55. 28-01-2019 Placement of Head Assistants who have crossed 50 years of age to the post of Section Officers in light of SRO-159 of 2019. 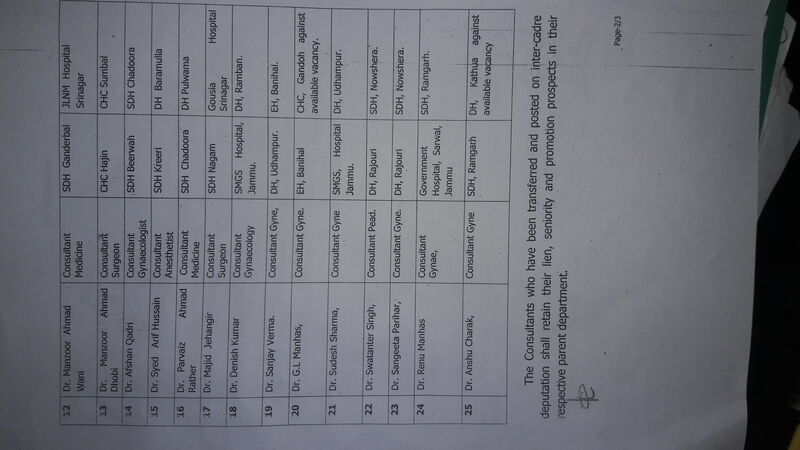 28-01-2019 Placement of Senior Assistants who have crossed 50 years of age in light of SRO-272 of 2018. 10-01-2019 CIRCULLAR- Annual Tax Deduction at Source for the Financial year 2018-19 CMO Srinagar. 26-12-2018 Reinstatement of Abdul Majid Mir Head Pharmacist Block Larnoo District Anantnag and Settlement of Intervening Period thereof.ORDER NO.1010-NG OF 2018. 26-12-2018 Constitution of Committee. Order No.1008-NG-2018. 26-12-2018 CORRIGENDUM TO ORDER NO. 1019-NG OF 2018. DATED- 17-12-2018. 26-12-2018 Transfer of Junior Pharmacists. Order No. 1018-NG-2018. 26-12-2018 Transfer Order of Mr. Fayaz Ahmad Shah - Health Educator. Order No. 1017-NG of 2018. 19-12-2018 Promotion of Supervisory Pharmacists to the post of Head Pharmacists Order no 1019-NG-2018 dated 17-12-2018. 10-12-2018 Promotion of Pharmacists category in their own pay and Grade (OPG) and furnishing of vacancy position thereof Oder no Est-11-gen-160-3860-3924..
10-12-2018 Distribution of work Order no 1002-NG of 2018. 06-12-2018 Drawl of Salary against Identical Posts Order no DHSK-Gen-2018-circ-3334-63. 17-11-2018 Attachment Order of Rubeena Moti Order No. DHSK-Gen-NYCS-NYKS-3111-34. Dated-12-11-2018. 17-11-2018 SWP No. 2322-2013 - titled Sofia Paul and others V-S State of J&K & Others. Order No. 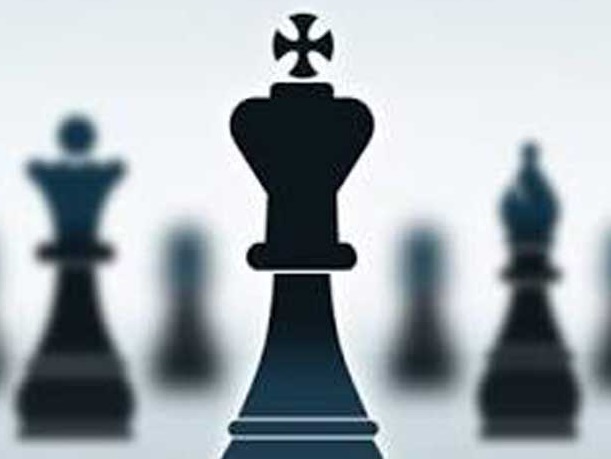 Est-5-NG-Legal-SGR-756-3386-90. 01-11-2018 Transfer - Adjustment of Chauffer - Driver. Order No. 855-NG of 2018. 05-11-2018 Visiting the Directorate without station permission from concerned chief Medical Officers by field staff - Doctors. Order No. 2166 - 2255. 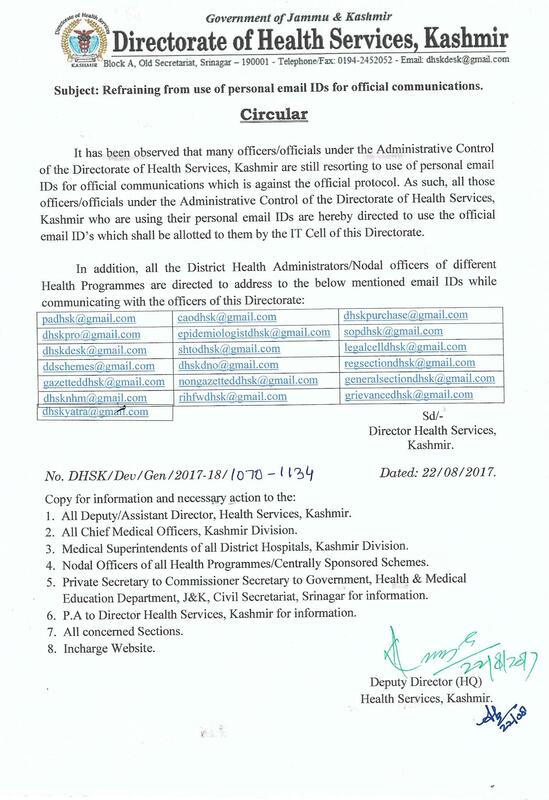 05-11-2018 Misbehavior of Employees of Health & Family Welfare Confederation with the clerical staff of Directorate of Health Services, Kashmir on 01-11-2018 - explanation thereof. 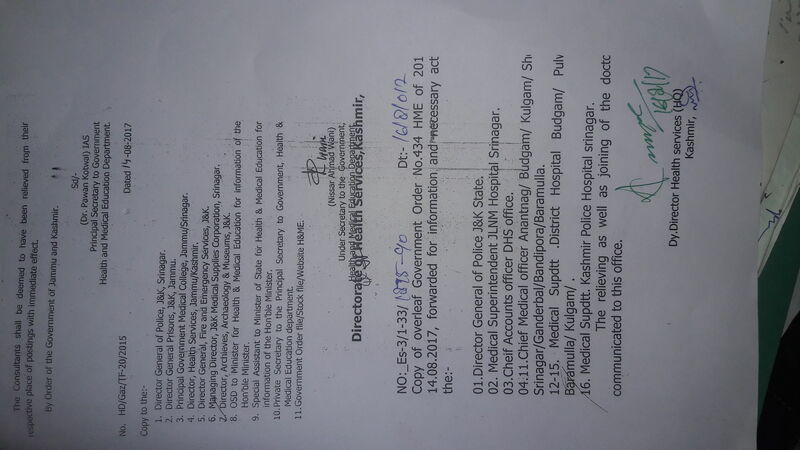 24-10-2018 Surprise visit of DHS Kashmir & other Divisional Officers to Various Health Institutions of different Districts & Explanation thereof. Order No. 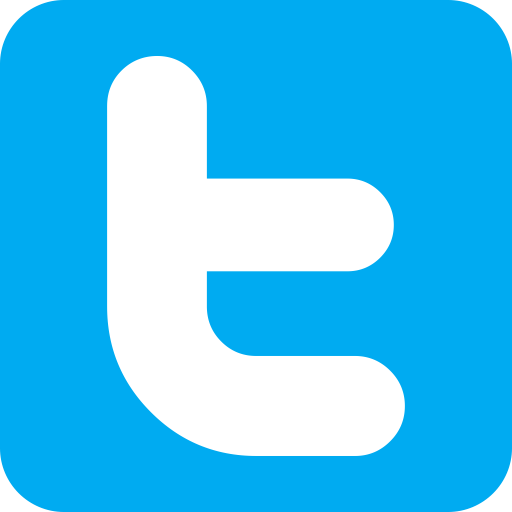 Est-ii-Exp-Gen-158-3674-76. 15-10-2018 Secretariat Assistants Training (SATC) in respect of Sr. Assistants of Head of the Departments Offices of Kashmir Division. Order No. 723 - NG of 2018. 15-09-2018 Transfer of Driver Order no 685-NG of 2018 Dated 11-09-2018. 15-09-2018 Transfer of Driver Order no 692-NG of 2018 Dated 11-09-2018. 14-09-2018 Transfer - Adjustment of Sr. Ophthalmic Technician Order no 690-NG of 2018 Dated 11-09-2018. 14-09-2018 Transfer-Adjustment of Sr. Laboratory Technicians Order no 689-NG of 2018 Dated 15-09-2018. 12-09-2018 Transfer Order of Sr. Dental Technicians Order no 684-NG of 2018 Dated 11-09-2018. 12-09-2018 Transfer Order of Jr. pharmacist Order No 676-NG 2018 Dated 11-09-2018. 12-09-2018 2nd time bound promotion case of Mr. Naser Ahmad Pandith Jr. Theatre Technician Order no 675-NG of 2018 Dated 11-09-2018. 12-09-2018 Detachment Order of Mr. Ather Parvaiz Sr. Pharmacist Order No 670-NG of 2018 Dated 10-09-2018. 06-09-2018 Absent from legitimate duties and transfer thereof Order No 662-NG of 2018 Dated 05-09-2018. 05-09-2018 Transfer Order of Mr. Sajad Ahmad Bakshi Order No. 654-NG of 2018 Dated 01-09-2018. 01-09-2018 Transfer Order of Supervisory Pharmacists Oder no-650-NG of 2018. 27-08-2018 Transfer Order of Mr Hilal Ahmad Handoo Jr. Pharmacist Order No 647-NG of 2018 Dated 25-08-2018. 25-08-2018 Transfer of Sr. Driver. Order No. 640-NG of 2018. 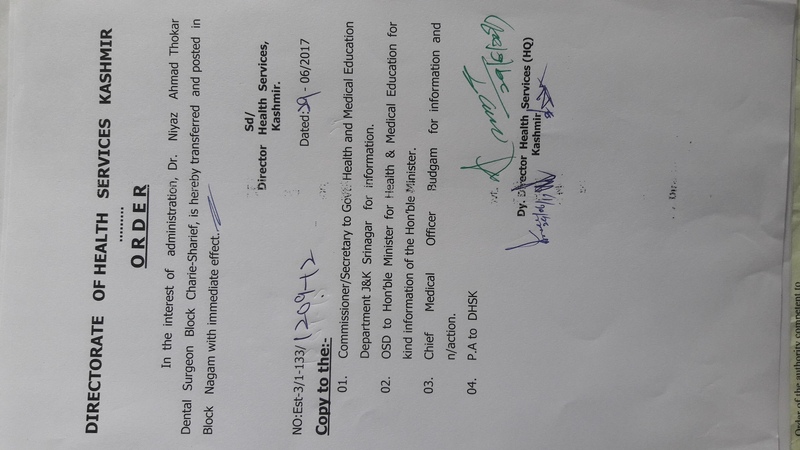 25-08-2018 Reinstatement of Services In Respect of Mr. Abdul Rashid Reshi Health Educator Block Tangmarg District Baramulla. Order No. 644-NG of 2018. 02-08-2018 Transfer Order. Order No. 614-NG of 2018. 02-08-2018 Transfer Order of Jr. Pharmacists. Order No. 613-NG of 2018. 01-08-2018 Detachment of Jr. Driver. Order No. 598-NG of 2018. 01-08-2018 Transfer of Jr. Physiotherapist. Order No. 612-NG of 2018. 31-07-2018 Modification to the Transfer Order of Mr Amjad Ali Shah Sr. Theatre Technician Order No. 564NG of 2018. 27-07-2018 Transfer of Sr. Theatre Assistants. No. Est-II-NG-Sr. Theat. Asst-01-05-3244-49. 27-07-2018 Transfer of Chauffer. Order No. 569-NG of 2018. 26-07-2018 Transfer Order. Order No. 568-NG of 2018. 24-07-2018Transfer of Pharmacist Category. Order No. 563-NG of 2018. 24-07-2018 Transfer of Pharmacist Category. Order No. 565-NG of 2018. 24-07-2018 CORRINGENDUM to Order No.563-NG of 2018. 23-07-2018 Constitution of Committee. Order No. 538-NG of 2018. 21-07-2018 Suspension of Mr. Ab. 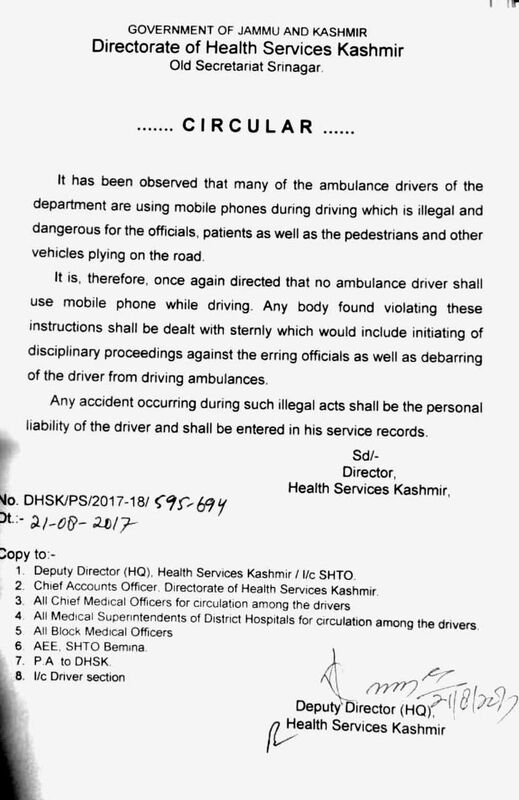 Rashid Reshi Health Educator Medical Block Tangmarg Baramulla. Order No. 533-NG of 2018. 20-07-2018 Augmentation of Secretariat Assistant's Training Course (SATC). Order No. 1141-GAD of 2018. 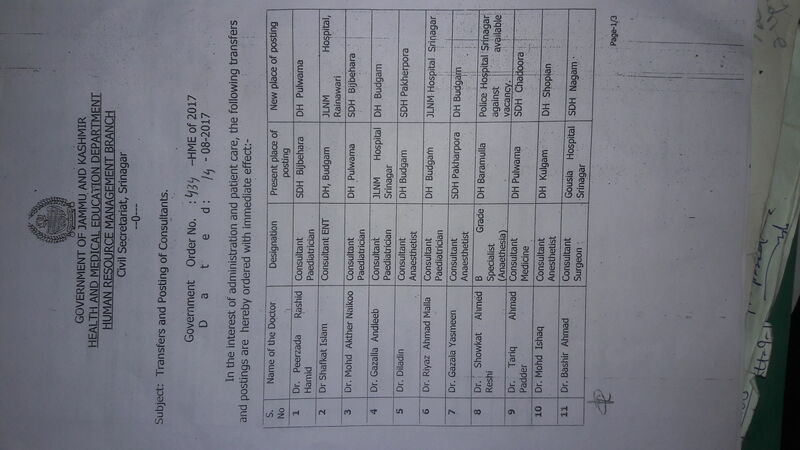 12-07-2018 Transfer Order of Sh. Shamsheer Chand Jr Driver. Order No. 509-NG of 2018. 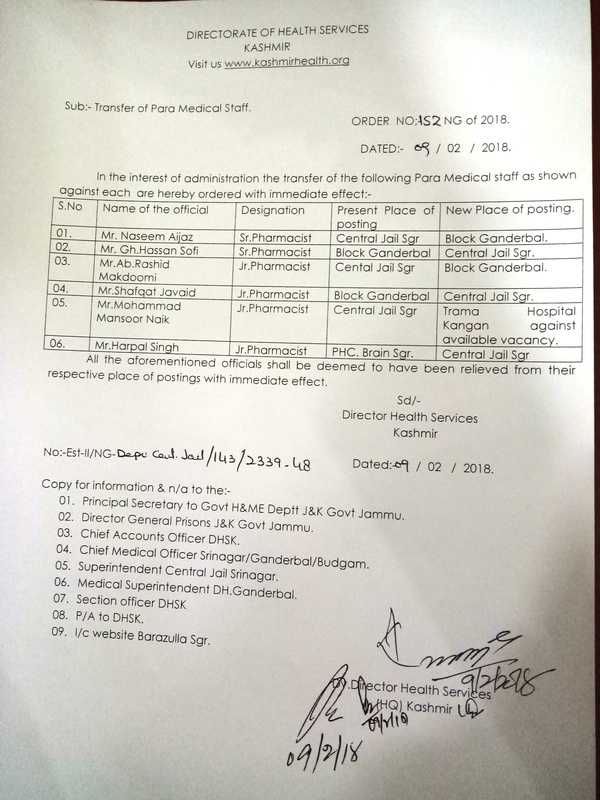 11-07-2018 Transfer Order of Mr. Zaffar Ahmad Akhoom Head Pharmacist. Order No. 503-NG of 2018. 11-07-2018 Detachment Order of Mr. Ghulam Hassan E.M.S. Order No. 504-NG of 2018. 10-07-2018 Transfer Order. Order No. 502-NG of 2018. 09-07-2018 Relieving Order of Mr. Ghulam Nabi Sheikh Sr. Pharmacist. Order No. 497-NG of 2018. 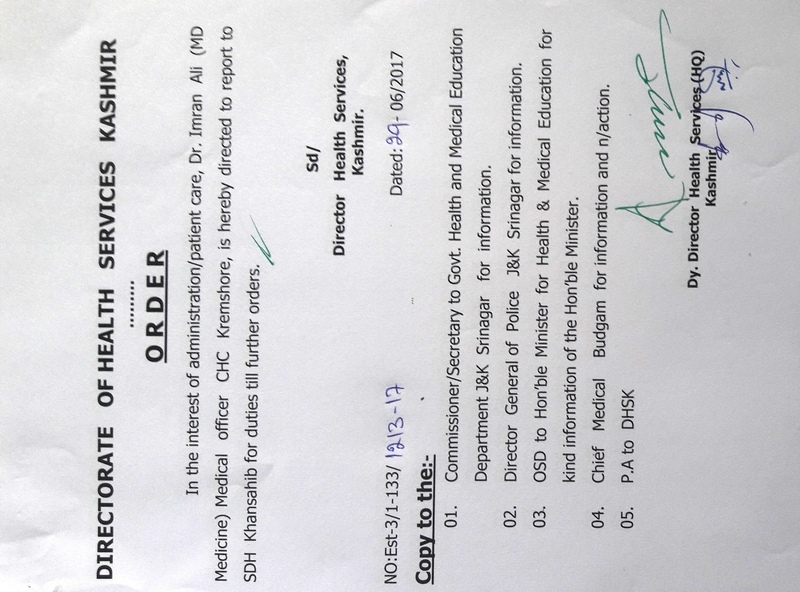 07-07-2018 Transfer Order of Mr Kiran Kumar Jr Pharmacist. Order No. 491-NG of 2018. 07-07-2018 Detachment of Staff. Order No. 488-NG of 2018. 02-07-2018 Mutual Transfer - Inter - District (Deputation Basis). Order No. 177-HME of 2018. 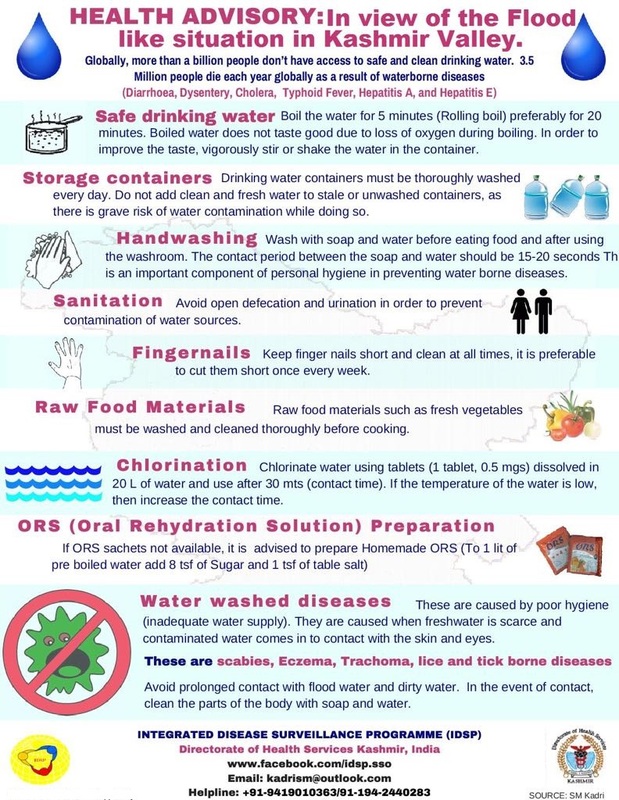 Health Advisory- In view of the Flood like Situation in Kashmir Valley. 28-06-2018 Biometric Attendance System - Compulsory for all Employees. 28-06-2018 Transfer of Sr. Laboratory Technician's. Order No. 479-NG of 2018. 25-06-2018 Utilization of Services of Sr. Assistant Mr Fayaz Ahmad . Order No. 466-NG of 2018. 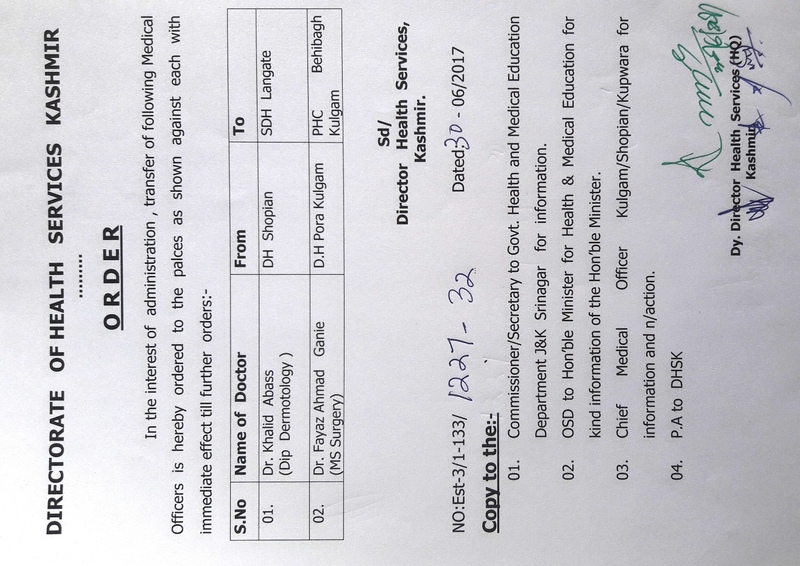 23-06-2018 Transfer Order of Junior Pharmacists Mr Suhail Ah Bhat & Mr Firdous Hussain Wani. Order No. 465-NG of 2018. 23-06-2018 Transfer Order of Mr. Peer Mohammad Zahoor Head Pharmacist. Order No. 463-NG of 2018. 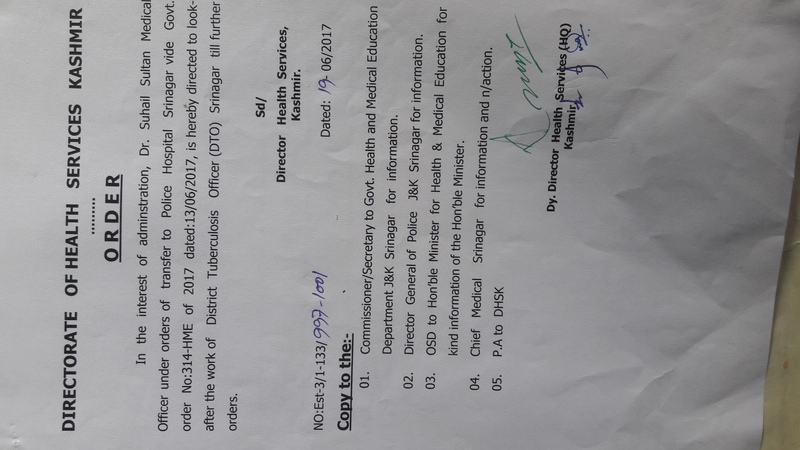 21-06-2018 Detachment Order. Order No.460-NG of 2018. 21-06-2018 Temporary Deputation to Jeddah Saudia Arabia for Haj. Order No. 459-NG of 2018. 04-06-2018 Utilization of Services of Jr. Dental Technician. Order No. 444 - NG of 2018. 04-06-2018 Attachment Order of Shamsheer Singh Driver. No. Est - 4 - NG - 134 - 531 - 35.pdf. 02-06-2018 Transfer Order of Jr. Pharmacists. Order No. 442 - NG of 2018. 02-06-2018 ModificationTransfer Order of Mr. Sheikh Bilal Sr. Lab Technician NTPHC Bherampora. Order No. 441 - NG of 2018. 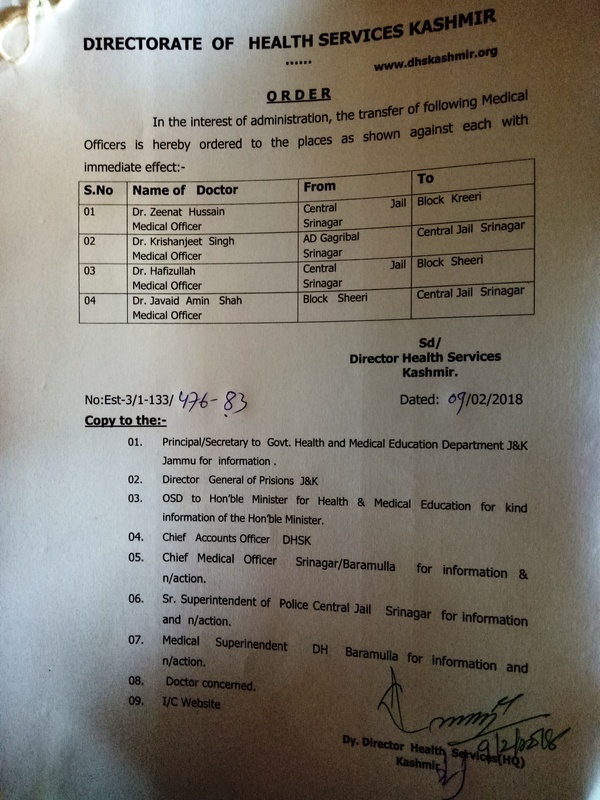 01-06-2018 Detachment Order of Mohammad Iqbal Bhat Jr. Laboratory Technician. Order No. 440-NG of 2018. 01-06-2018 Endorsement Transfer of Mukesh Kumar Driver from Hardaboora Kunzer. Order No. 275-HME of 2018. 30-05-2018 Transfer of Jr. Dental Technician. Order No. 433-NG of 2018. 29-05-2018 Transfer Order. Order No. 430-NG of 2018. 30-05-2018 Mutual Transfer of Mudasir Ahmad Mir & Mustafa Khan. 29-05-2018 Modification in Transfer of Mr. Khalid Muzaffar CHO Block Qazigund. Order No. 410-NG-2018. 28-05-2018 Detachment Order of Habibullah Haidary Sanitary Inspector. Order No. 411-NG of 2018. 27-05-2018 Endorsement Order of Mushtaq Ahmad Sheikh BHW. Order No. 405-NG of 2018. 25-05-2018 Transfer Order. Order No. 418 - NG of 2018. 25-05-2018 Attachment Order of Mr. Sheraz Ahmad Dar Sr. Pharmacist Order No. 417-NG of 2018. 24-05-2018 Compassionate Appointment Case of Mr. Arshid Ahmad Dar Under SRO-43 of 1994. 23-05-2018 Transfer of Jr. Drivers. Order No. 407-NG of 2018. 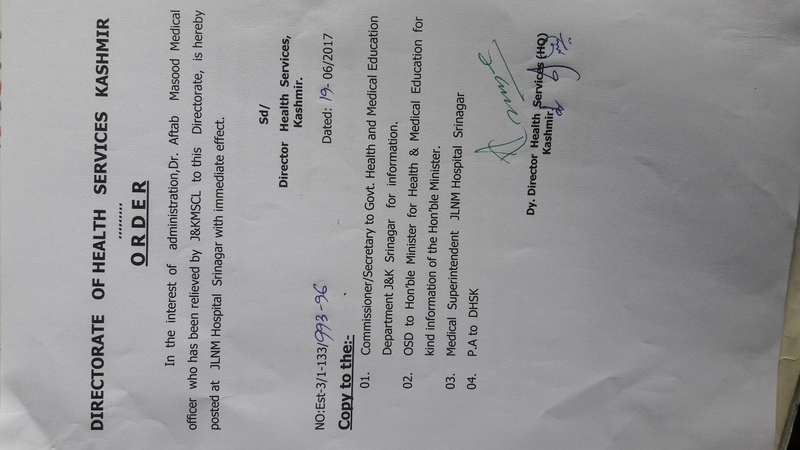 16-05-2018 Transfer of Para Medical Staff. Order No. 397-NG of 2018. 04-04-2018 Selection of candidates under SRO-202 Order No 362-NG of 2018. 26-04-2018 Promotion Order of Dr Saleem-Ur-Rehman. Order No. 685GAD of 2018. 10-04-2018 Transfer Order. Order no 368-NG of 2018. 09-04-2018 Attachment Order. Order no 336-NG of 2018.pdf. 07-04-2018 Transfer of Senior Driver Order no 363-NG of 2018. 07-04-2018 Transfer of chauffer Order no 360-NG of 2018. 05-04-2018 Detachment of Senior Assistant. Order no 354-NG of 2018. 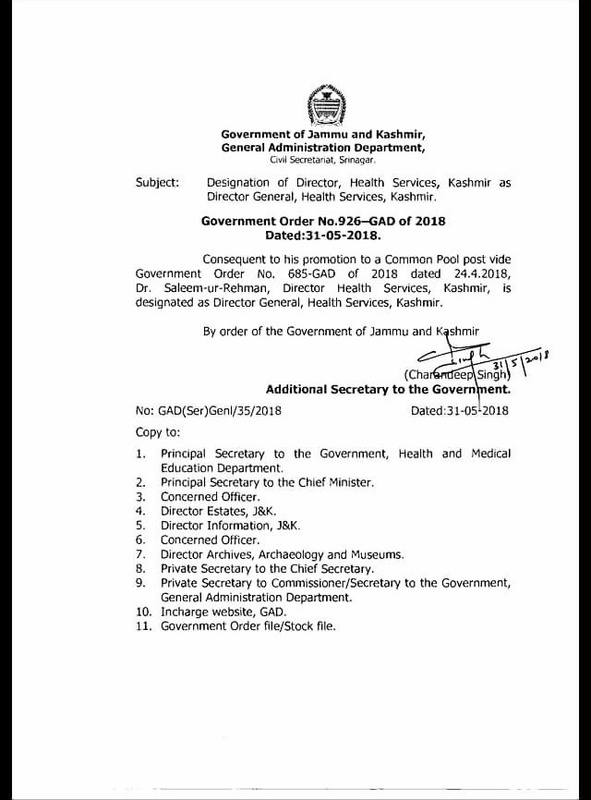 05-04-2018 Detachment of Senior Assistant Order no 355-NG of 2018. 05-04-2018 Assignment charge of Section Officer Order no 361-NG of 2018. 31-03-2018 Detachment of Driver. Order No.345 - NG of 2018. 31-03-2018 Transfer of Senior Drivers. Orders No. 342 - NG of 2018. 31-03-2018 Extension in Mutual Transfer. Order No. 57 - HME of 2018. 31-03-2018 Extension in Mutual Transfer Order No. 80-HME of 2018. 31-03-2018 Deputation-Extension of deputation period. Order No. 56-HME of 2018. 31-03-2018 Attachment of Jr. Assistant. Order No. 349 - NG of 2018. 30-03-2018 Transfer of Jr. Dental Technicians. Order No. 329 NG of 2018. 30-03-2018 Mutual Transfer of Sr. Lab. Technicians. Order No. 336 NG of 2018. 08-01-2018 Transfer of Jr. Pharmacists Order No. 04 NG of 2018. 04-01-2018 Transfer Order of Mtr. Nusrat Rashid CHO Order No. 01NG of 2018. 04-01-2018 Quasi Permanent of Sh. Chandan Kumar Dhar Jr. Pharmacist retired from Govt. Services on 31-03-2017. 04-01-2018 Detachment Order of Mtr. Aanisa Zulal Jr. Dental Technician. 23-11-2017 imposition of complete ban on engagement of casual~Seasonal labourers in Govt. depts. 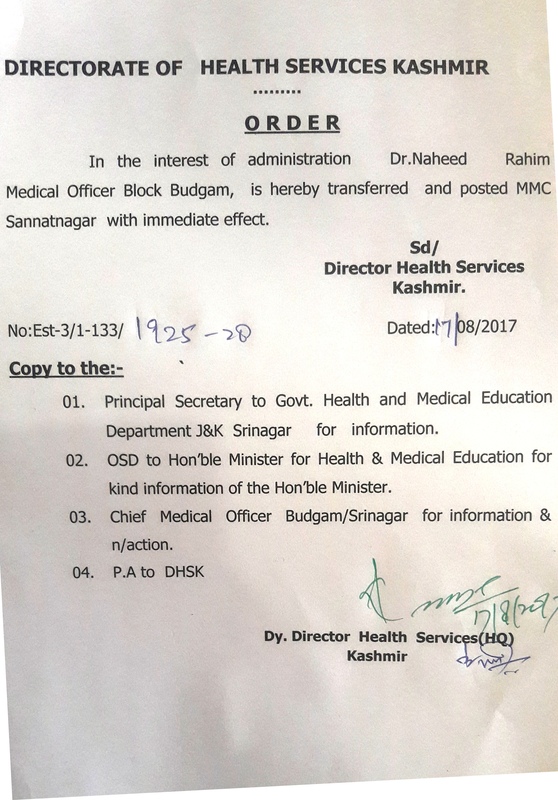 Transfer Order of Sr. Assistant Mr. Mohd Amin. 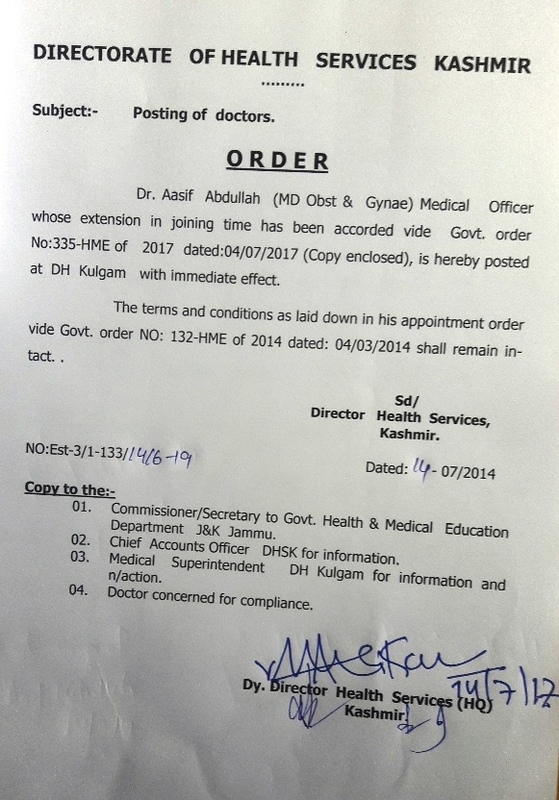 Posting of Dr Asif Abdullah. Posting of Dr Imran Wani. Attachement of Dr Imran Ali. 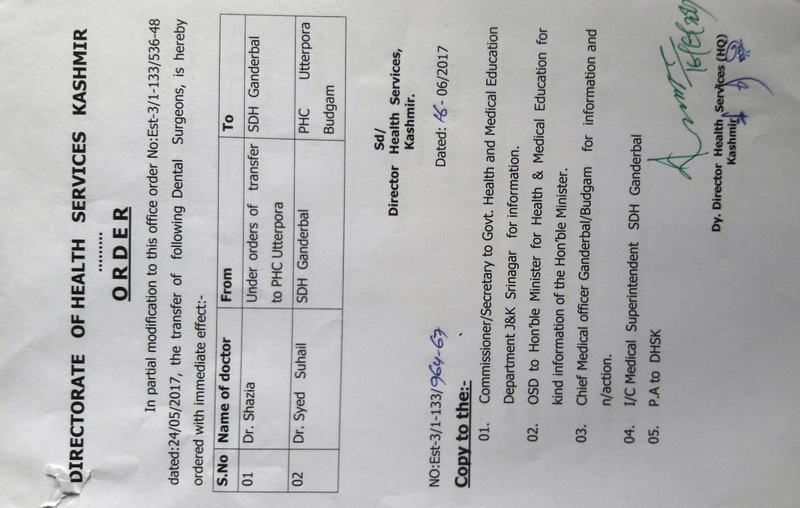 Attachment Order of Dr Suhail Sulatn . 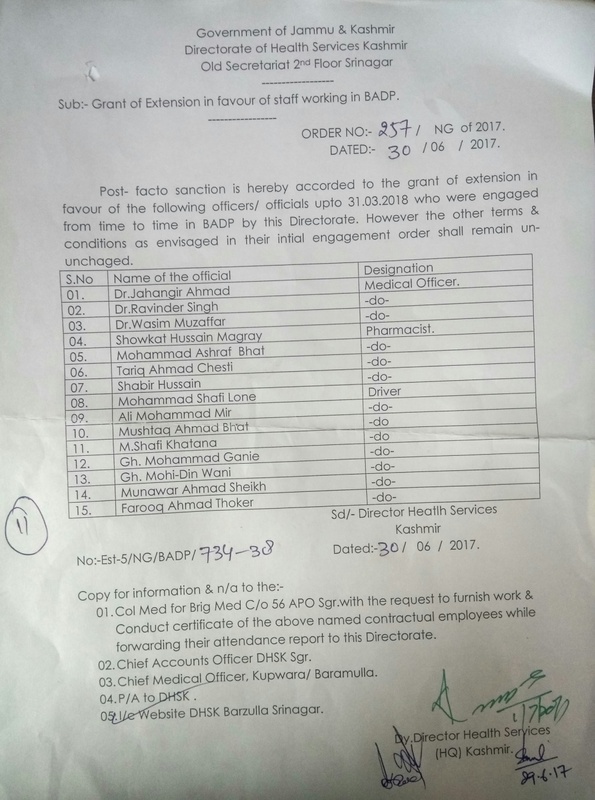 Posting order of Dr Aftab Ahmad. Transfer Order of Dental Surgeons 1. 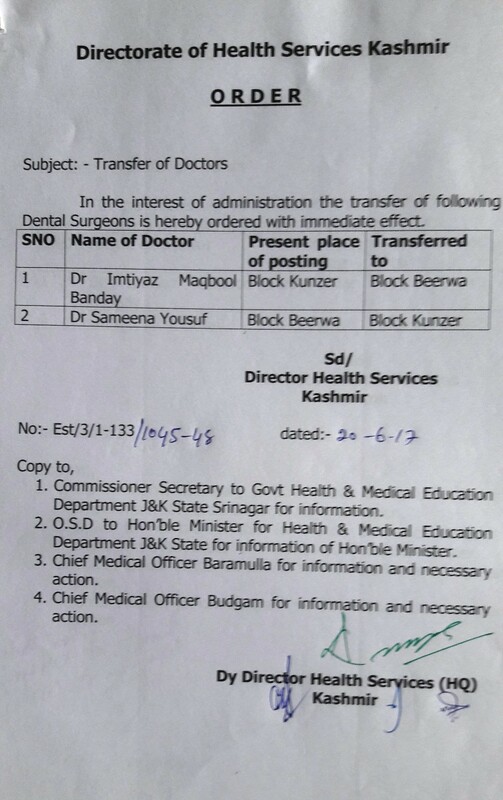 Transfer Order of Dental Surgeons. 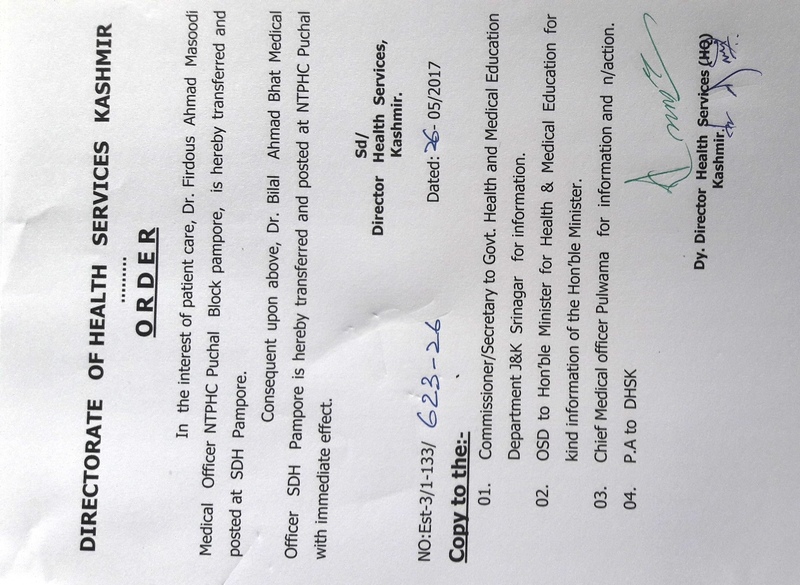 Transfer Order of Dr Firdous Ahmad Masoodi. 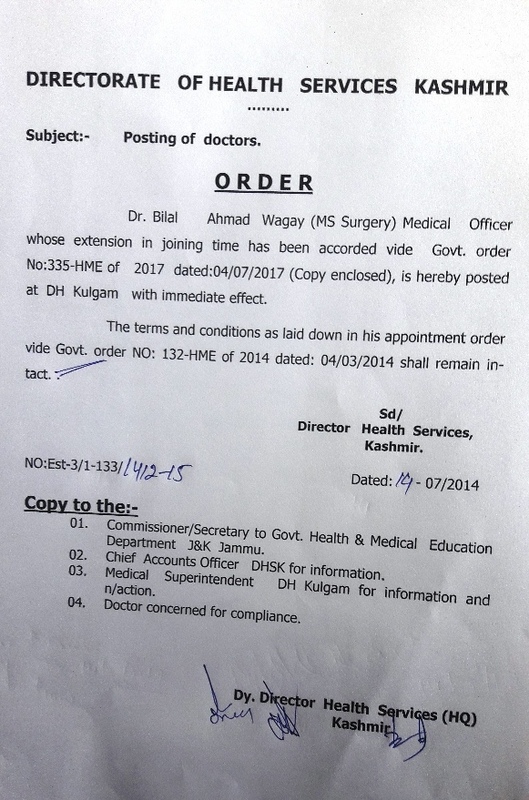 Transfer order of Dr Niyaz Ahmad Thoker. Redressal of grievances recieved from Hon'ble CM's grievance cell..
Grant of extension in favour of staff working in BADP. 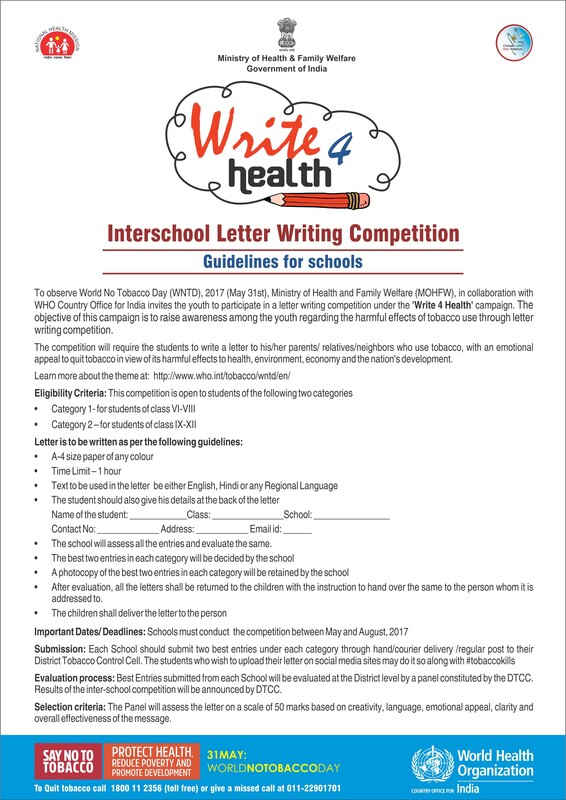 INTER SCHOOL LETTER WRITING COMPETITION. 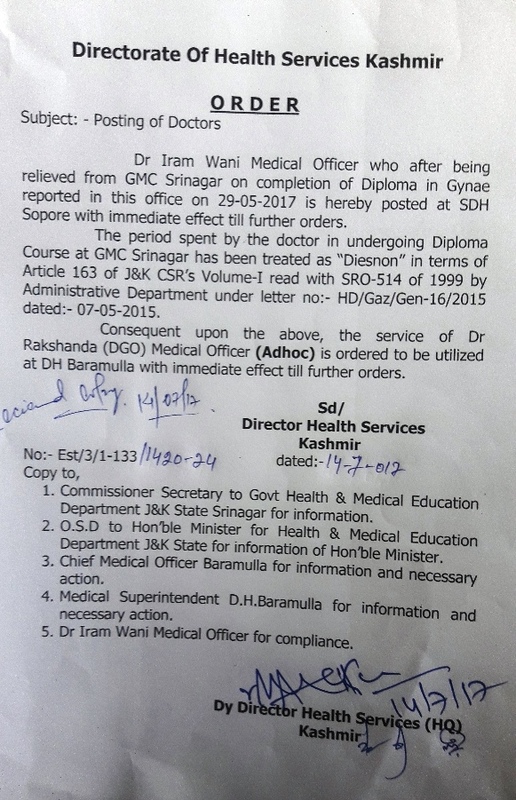 Transfer and posting of Doctorss. Redressal of Grievances recieved from Hon'ble CM's grievance cell.